Ask fellow campers about "Kitsap State Park" and nearby attractions. Wouldn't stay here again unless I had to be in the area and there was nowhere else available. We camped at Kitsap State Park in a Truck Camper. This is a smallish campground at the tip of the Kitsap Peninsula, within shouting distance of Seattle (1.5 hours, including the ferry ride). 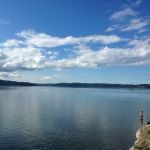 The location is wonderful, on the bluff above a beautiful rock beach and the Hood Canal. In season, there's oystering and clamming. The downside here is there's a pavilion that shares a parking lot with the campground, which is used for events. There were weddings there both days that we were there, and the camp host said that during the summer, there are weddings daily. One of the weddings was fine, but the other one had loud music for several hours that we could hear from our site. The music stopped promptly at 9:30 pm, so it was quiet at night, but I value my quiet, and wouldn't come back for this reason. The campground is divided into two loops. Sites 1-18 are for RV's, sites 19-38 have no hookups, and are mostly too small for anything larger than a van. Sites 1-3 are 50A power and water. Sites 4-18 have full hookups. Most of the sewer hookups were slightly uphill from the parking pad. All of the sites were back-in, perpendicular to the road. The turnarounds were pretty tight as well. Big rigs would have some trouble here. RV sites were very close together, especially for a state park. All of the RV sites were in full sun, with no trees. The camp host was excellent. Very friendly and helpful. The state parks system is trying out a new type of backflow preventer on all of the hose bibs, and he had to explain how to use it to every single camper as they arrived. I'm all in favor of backflow preventers, but these were pretty hard to use. Water pressure was low, less than 40 PSI. The map shows a dump station, but I never saw it. Good Verizon and AT&T coverage. No OTA TV reception. We don't have satellite, but a neighbor told us he couldn't get satellite because of the trees. Being a state park, there's no wifi or cable. We camped at Kitsap State Park in a Motorhome. First of all, the reservation system is flawed. When I checked there were only 2 RV sites available. I booked one and upon arrival we found over 10 available. You should try and check with the park and not rely on the reservation system. It is a nice state park with no 50 amp, no Wi-Fi, no TV [even over the air], no sewer or dump. They say that they are working on the dump, but it doesn't look like it. Sites 17-18 (not reservable) are the only shaded sites and they are reluctant to rent 18 as they call it an overrun site even though it is the best site in the park. The other sites with electric are in the sun and offer no privacy. Rigs of 40' will need to be careful of the driveway and approach to most sites due to lack of turn radius. The park is kid friendly and caters a lot to the Scouts, whom sometimes get a little noisy. The rocky beach is approx 200 yds from the camping sites. The park is nicely kept and the staff is very helpful. @ $29/nite its overpriced for what you get. We camped at Kitsap State Park in a Fifth Wheel. Wow! A beautiful location. The park is set in a wooded area, at walking distance of a beach on the Hood Canal where kids and adults were bathing. I recommend this park for the variety of activities. It's also kept clean. There are no dump stations handy, no sewer either. We camped at Kitsap State Park in a Travel Trailer. There are 38 sites available. Sites 1-19 are back-in RV hookup sites (both 3 prong & standard outlets), and sites 20-38 are no-service camp sites. Water was available despite the signs to the contrary. A new pump-out station was just opened. The Camp Host is at site 39. Plenty of open grass, a playground, and beach access make this a wonderfully entertaining park. Showers are private, cost 50 cents for 3 minutes and are use tokens from a vending machine which takes both $1 and $5 bills. There is a Chevron 1 mile away with a well stocked mini-mart. Privacy is the only draw back. The RV sites are extremely narrow, kind of like camping at a tailgate party. Only tent site 31 offers any seclusion via foliage barrier. Overall, children and pet owners will appreciate the large park like setting. We camped at Kitsap State Park in a Motorhome. Washington should be very proud of it's state parks, and this is one they should be particularly proud of. Aside from the incredibly beautiful natural surroundings, it is managed by very helpful and friendly rangers and camp hosts that were gracious and anxious to help any way they could. The rest rooms and showers were immaculate. We enjoyed our stay here very much and would not hesitate to recommend this park to anyone. Like all state parks, you must be able to live without cable TV and WiFi, and there are no sewer hookups, but the natural beauty and tranquility remind you what camping is supposed to be all about. A wonderful experience. We camped at Kitsap State Park in a Travel Trailer. Lovely state park. Limited hook-ups (only 15 available). Small cabins on site for rent, plenty of space for tenting and small RV rigs. Eighteen sites will accommodate larger units, but must back in. Trees, grass, access to Hood Canal for clamming or oystering. Ranger and camp host very friendly and accommodating. Day use allowed, so some itinerant traffic in and out of park, but camping sites protected from through traffic. Road access paved, very level grassy sites with picnic tables. No dump site available, but a very nice place to stay. 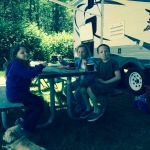 We camped at Kitsap State Park in a Fifth Wheel. Are you affiliated with Kitsap State Park ?